This class is appropriate for intermediate level guitarists. 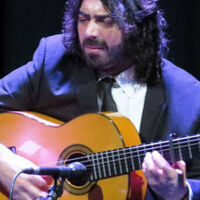 Juan Requena is one of the most respected flamenco guitarists of his generation. Known for his electrifying charisma, musicality and flawless technique, Requena was awarded the Giraldillo Prize for Guitar Accompaniment at the 2012 Flamenco Biennial in Seville. Born in Málaga, Spain, Requena served as music director for the Andalusian Dance Company and has collaborated with Duquende, Guadiana, Arcángel, La Tremendita, Rafaela Carrasco, La Moneta, Eva Yerbabuena, Joaquín Grilo and Farruquito (in the film Flamenco Flamenco by Carlos Saura). His first solo recording, Arroyo de la Miel, was released in 2015.